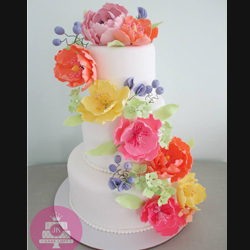 A bride is not complete without a lovely bouquet to complement her wedding gown. A walk down the aisle is more romantic when the path is lined with floral profusion. 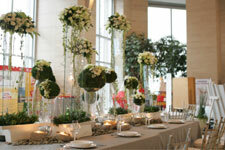 A wedding theme cannot be achieved without flowers to set the motif and ambiance. 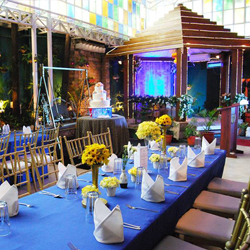 This is why the recently held Kasalang Filipino 2007 wedding fair in The Enterprise Center, Makati highlighted the beauty and role of flowers in Filipino wedding celebrations. Pacific Blooms’ romantic English wedding theme showcased the most beautiful, diverse profusion of Ecuadorian roses the local wedding industry has ever seen. 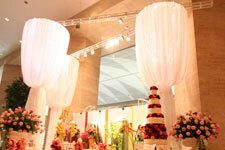 Its 8-meter high elaborate wedding display left event guests with no doubt of the scale and grandeur of its newly launched wedding styling services. Holland Tulips, one of the country’s known importer of flowers, introduced a cornucopia of imported varieties through a Japanese Spring wedding concept. Holland Tulips cleverly infused more than 10 flower varieties and still successfully achieved the elegant simplicity and harmony of a Zen-inspired wedding setup. Not to be outdone, Henry Pascual, the event’s official stylist, chose to create a modern wedding interpretation out of creative use of local, indigenous materials. Of glass panels, grass balls, and white roses, the simple yet unique, clean yet visually arresting styling proved once again the ingenuity and originality of a Henry Pascual creation. 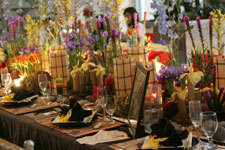 Kasalang Filipino 2007 is also the first local wedding fair to introduce the concept of Ikebana in weddings. No less than Mr. Serapion Metilla, president of Ikebana Ikenobo School, gave the talk and demonstration on the art of Ikebana to to-be wed guests. 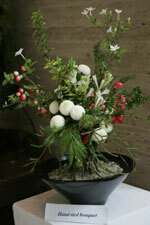 His floral arrangements were also put on display in the event’s entrance last Oct. 10-11. 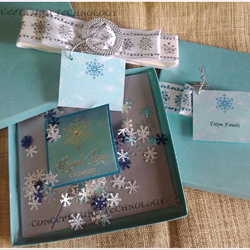 Completing the array of wedding services for to-be wed guests, the 2-day wedding fair also showcased diverse wedding fashion designs, jewelries and accessories, catering choices, wedding cakes, invites, and souvenir options. A photo gallery of famous local Churches complimented the line up of wedding photographer exhibitors. And to make the event truly worthwhile, 5 lucky couples took home the following grand raffle prizes: PhP 10,000 worth of Ever Bilena cosmetics, 5-layer Grand Red Ribbon wedding cake, honeymoon package to Bohol, Celestial Artistry wedding rings, and Standard Appliances showcase. Please visit www.kasal.com for the Kasalang Filipino 2007 Manila leg exhibitors' complete contact details. 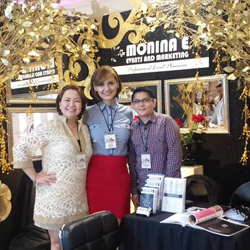 Kasalang Filipino is a nationwide wedding fair road show aimed at tying 11 Philippine cities with one goal of promoting the local wedding industry. The following are the 11 cities of the 2007 road show – Tagaytay, Legaspi, Dumaguete, Tarlac, Iloilo, Cagayan de Oro, Davao, San Pablo, Dagupan, Cebu, and Manila. Kasalang Filipino 2007 is co-presented by Kasal.com and ABS-CBN; and is made possible by Philippine Airlines, Fuji-YKL, Chinabank, Standard Appliances, Colgate-Palmolive, Ever Bilena Cosmetics, Red Ribbon Bakeshop, Red Hat, MozCom PayEasy, QP Designs, Ariel Javelosa Photo & Video, Bitstop Network Services, Pacific Blooms and the following media partners: ABS-CBN Regional Network Group, Lifestyle Network, SkyCable, DWRR, My Only Radio, Metro Weddings magazine, Philippine News, Manila Bulletin’s About Weddings, Business World, Business World High Life, The Manila Times, Real Living magazine, Flavors magazine, Entrepreneur magazine, The Beat magazine, Sun.Star, OFW Ngayon, Media G8way, loCalDirect, Philstar.com, Yehey.com, HerWord.com, PinoyExchange.com, DigitalFilipino.com, Tsinoy.com, Trabaho.com and ThePinoy.net.